This entry was posted on Monday, September 5th, 2011 at 8:23 am	and is filed under New work, Rings. You can follow any responses to this entry through the RSS 2.0 feed. You can leave a response, or trackback from your own site. Will a version of these become available to the public? I adore trees. 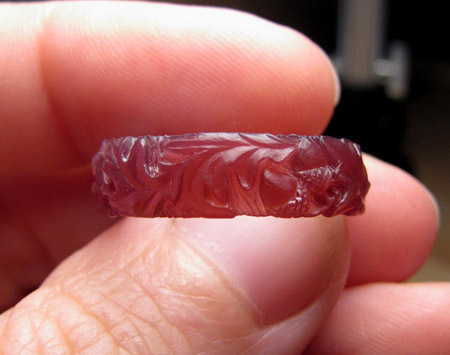 Hi, i found this image looking for acorn-patterns rings on the net and i think it’s just an amazing design. I was wondering if a silver version of the rings (i’m interested in the female one) are available for selling. Thank you so much for your attention! Are these rings available in sterling silver? Beautiful as usual! You are so talented and good luck in 2012! These rings are amazing!! I am looking for a 10 year anniversary band and this would be perfect. The oak and acorn are especially relevant for us because we have a son who passed away and is buried under an oak tree. One of the acorns fell off the tree and landed on his stone. It started to grow and we now have an oak tree growing in our yard! I would love to have one of these made!! These rings are stunning! 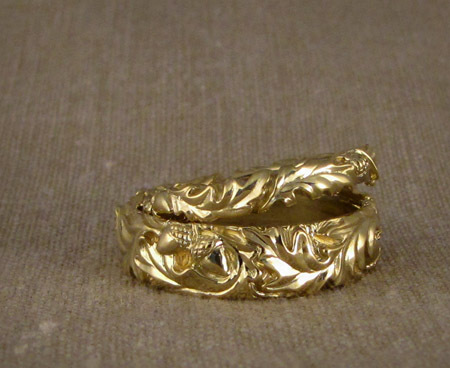 I have been looking for a long time for matching wedding bands with an oak leave and acorn motif. My husband to be loves oak trees, and always collects “acorn orphans” from the ground and plants them in a new place to help mix the oak gene pool! He is also my heart of oak, strong, immensely kind, gentle and loving. I would love it if we could wear these matching symbols of enduring love and renewal. If you are taking orders for these would it be possible to have them in silver? I would love to purchase a set of your oak leaves and acorn bands. Please contact me and let me know if they are available. Thank you. These rings are beautiful. Are they available for other couples? 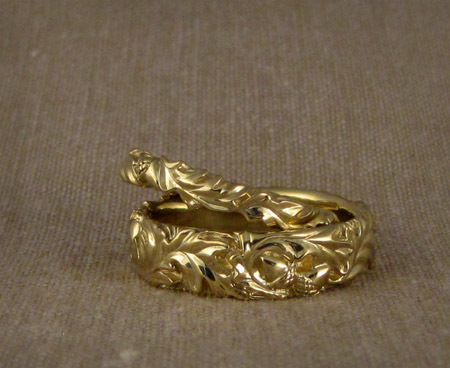 You made me an 14k yellow gold oak leaf and acorn ring. Since then my Husband has died and am planning to get re-married and I would like my new husband to have the samering. 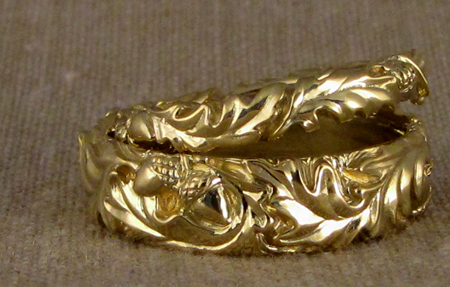 Size 10, 14k yellow gold oak leaf and acorn ring. What would the cost be for the man’s ring?? Thank you for your beautiful work. Marcia A Steinbach , marciaasteinbach@gmail.com thank you for your response. 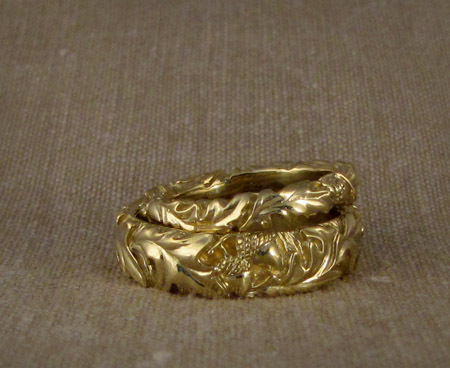 i love the oak leaves and acorn cluster 18-carat gold wedding band. Is it possible to order one? Please include the price. Thank you. Hello! My fiance and I are searching for wedding bands that are oak themed because his (soon to be my) family name is Oakes. These rings have a very special fluid and magical feeling to them, you have a real gift for creating beautiful pieces of art. We were wondering how much you would charge for a matching set of the women’s and Men’s ring. Also would you be able to tell us the cost difference if we wanted them in a different metal than gold? Looking forward to talking further with you! I found your White Oak Ring after so much research, then lost and found it again. I am trembling as I ask, can you make one for me, please? 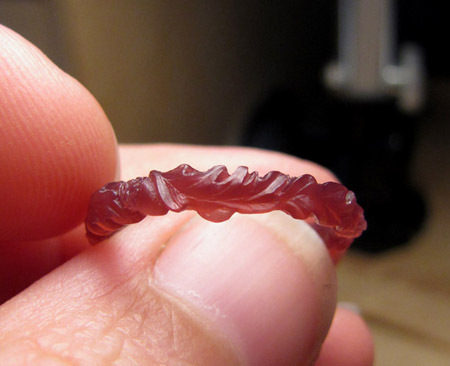 It is similar to my mother’s wedding ring and yours is far and away the most beautiful of all the rings I’ve seen. Sigh waiting to hear from you with much nervousness that you’ll say no. With all my hope, I hope you will be able to for all the most sentimental of reasons it would be of such comfort to wear and have my mom with me as well as a wedding ring from the finest Christian man I know. With my very best regards, Margaret Keller wood carver and professional clarinetist. So many have asked… is the narrower oak & acorn ring available in a size 10 in 10 ct or 14 ct yellow gold? If so, please send me a price quote. Thank you.